I've been working through some hapkido techniques in my head and trying to remember the footwork patterns involved. Footwork has consistently been the bane of my martial arts studies but I've been working on this for the past three months in class and chinks of light are appearing. Sometimes. Now, however, I realise I may be becoming a tad over-obsessed as I started dreaming about it last night. 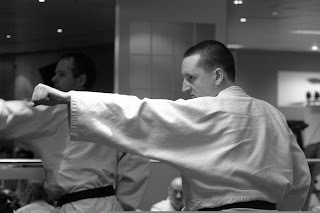 In my dream me and my fellow hapkido students were training but instead of us training in the do-jang we were training in the sports hall of my old school, which in my school days was a place of torture as I'd totally opted out of anything vaguely sporty. We were also not in uniforms but in old-stylee gym kit and my instructor was giving instructions which I could not hear no matter how hard I tried. Consequently everyone else was performing a punching, blocking, kicking routine with emphasis on the footwork part and when it got to me I just stood there not knowing what to do. Feeling a bit silly. I've had this type of stress dream before, usually after a play I've directed is over, and in it I'm on stage struggling to recall lines other people have been saying. After the dream repeats for a few nights I usually remember the lines then it goes away. In the martial arts dream, however, I went for a walk and chilled out by a river and told myself not to worry about it. Then I cried... Bizarrely I now realise the river was the same one I walked down when I lost an election at college to run the student union magazine. I cried then too. Wow. School sporting frustrations, college defeats and failures and bad footwork. Fortunately I can do something about the last one.